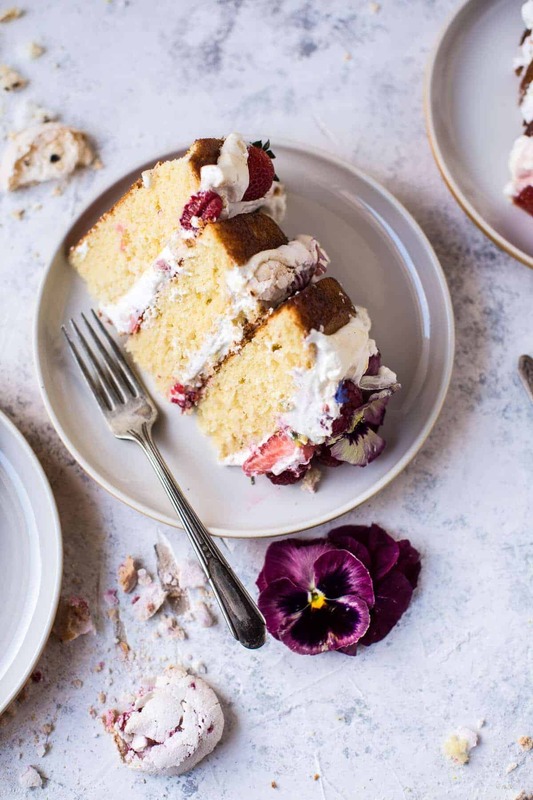 If this coconut eton mess cake with whipped ricotta cream doesn’t brighten your day, then I don’t know what will. You see, I told you!! SPRING!! I know, I know, spring doesn’t officially start until Sunday, but I just could not help myself. Gimme all the color please! Let’s recap: we started with this KILLER Shawarma Chicken Salad, then moved on to these pretty Blueberry Muffin Yogurt Bowls, killed Wednesday with this Green Goddess Zucchini Pasta and now we are ending on a major high note with this pretty, berry filled, Coconut Eton Mess Cake!! So yeah, Bring-On-Spring, I am SOO ready! Also, I’m pretty excited for Easter as well! I kind of love Easter. It’s just fun. Fun colors, fun food and then ok, I love the idea that with Easter comes lots and lots of chocolate. 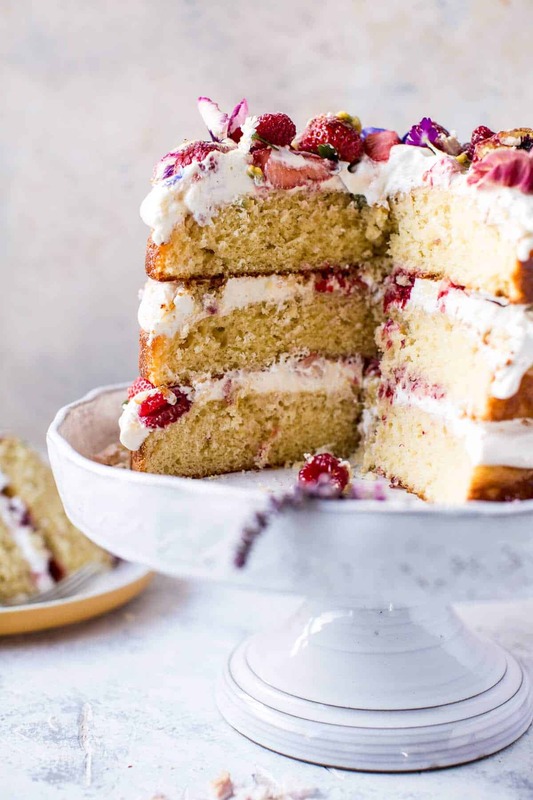 🙂 Oddly, there is zero chocolate in this cake, but it’s still cool, cause there is coconut, whipped ricotta and all this delicious fresh fruit. Lovin it. I’m going to attempt to keep things short today. I’m getting my wisdom teeth pulled in the morning and well, I’m basically trying to get as much done before then as possible. And yes, I am totally having a feast for dinner tonight in fear of the “soft foods” diet. But anyway, this COCONUT ETON MESS CAKE!! Isn’t it pretty? And fun?!? 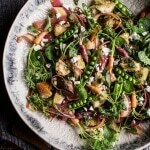 So perfect for Easter, it just kind of screams – SPRING! Ok and even summer too, I’m most definitely excited for that! Oh, and in case you were wondering…it’s still snowing here. 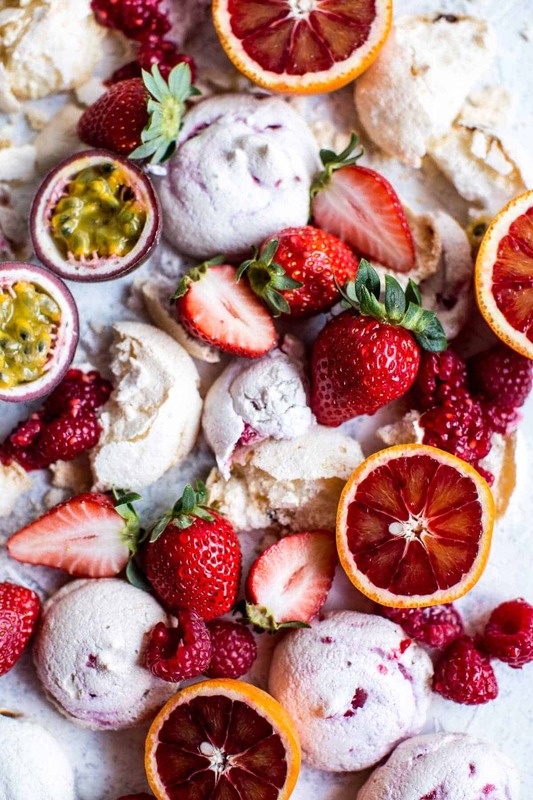 So if you’ve never heard of Eton Mess, it’s a traditional English dessert, usually made in a dish, with fresh fruit, smashed pieces of meringue, and cream. Super simple, but super delish. There are a ton of different fruit combos that can be used, but strawberries and bananas are most traditional… clearly I didn’t go completely traditional. I took the idea of fresh fruit with smashed meringue and cream and basically put it all into a cake (not a new idea, but so much more fun!). BUT not just any cake, nope, a vanilla coconut cake. It’s EVERYTHING. I know at first glance you might think this cake looks difficult make, but it’s actually the complete opposite. 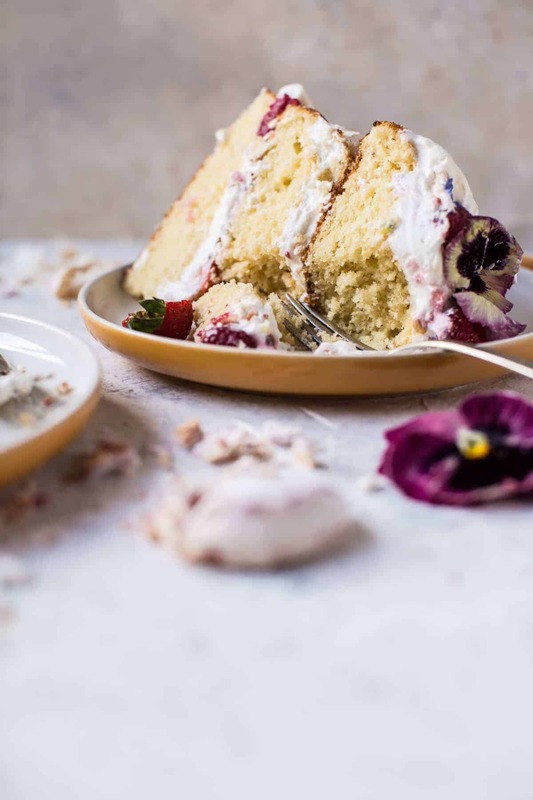 An Eton Mess (Cake), is well, messy… so you really can’t go wrong. 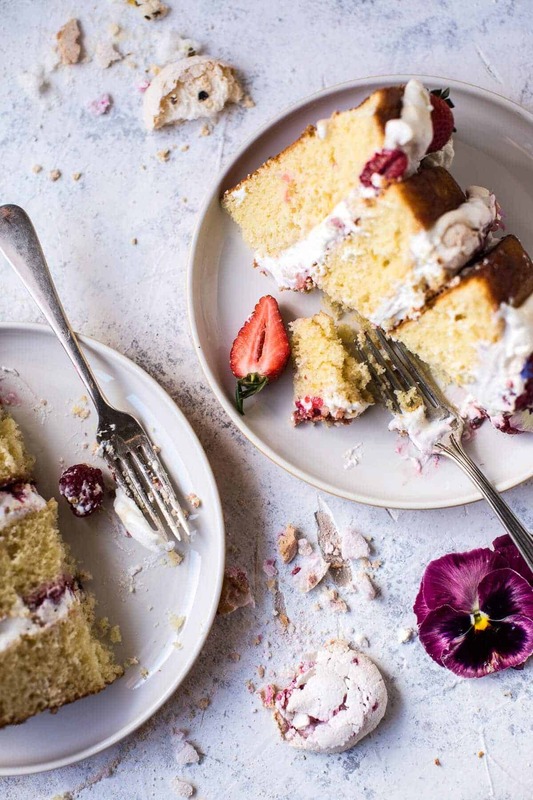 Just add fruit, cream and smashed meringue and inevitably your cake will be pretty and perfect! As I said, the cake itself is a yummy and crazy moist vanilla coconut cake. The cake portion alone is awesome and perfectly sweet, so I didn’t want to go too crazy with the toppings. I went with a whipped ricotta cream and some fresh strawberries, raspberries and passion fruit. I also had a few blood oranges on hand so I added some slices of those in as well. You can really go with any of your favorite fruit combos, all berries would be delicious! 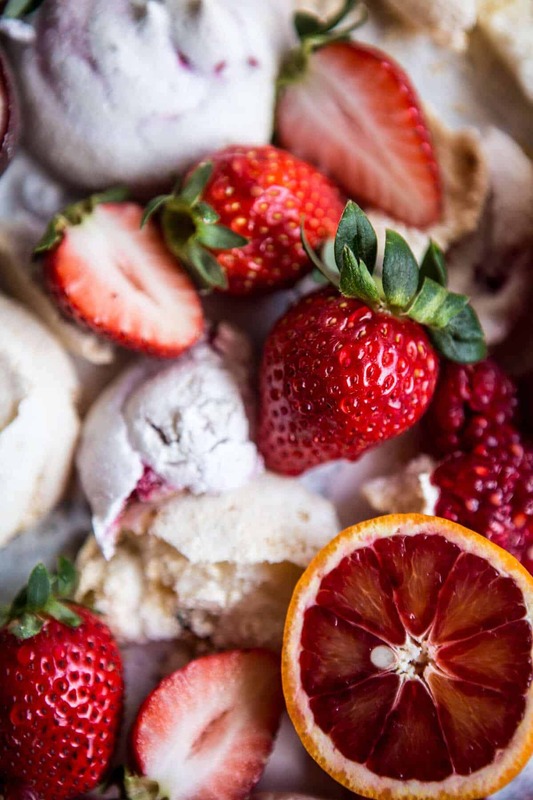 Once you have your cream + fruit, just crumble on some homemade or store-bought meringue. And then decorate with edible flowers or just add more fruit. Best part? Not only is this cake delicious, but it doubles as the perfect center piece for Easter Brunch or Easter Dinner. Coconut Eton Mess Cake with Whipped Ricotta Cream. 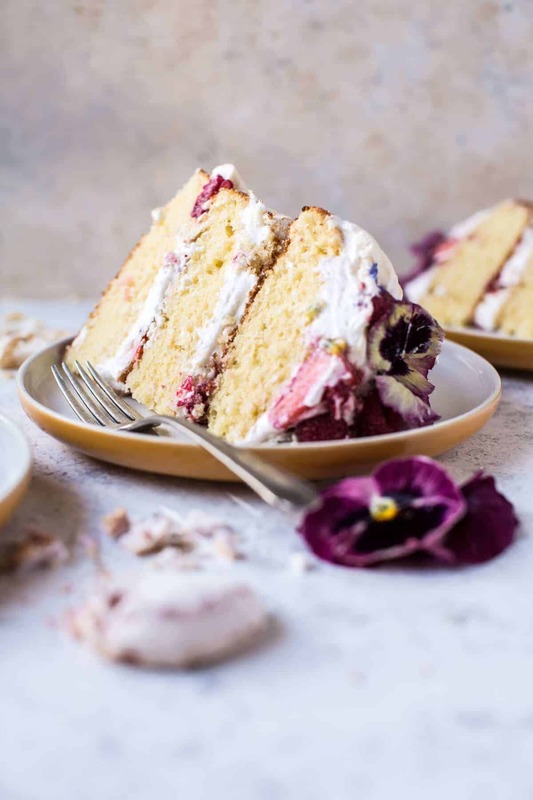 If this coconut eton mess cake with whipped ricotta cream doesn't brighten your day, then I don't know what will. You see, I told you!! Preheat the oven to 350 degrees F. Grease three 8-inch (or 9 inch) round cake pans, or line with parchment paper, then butter/spray with cooking spray. In the bowl of a stand mixer (or use a hand held mixer) beat together the canola oil, sugar, honey, eggs + egg yolks and vanilla until smooth. Slowly add the dry ingredients to the wet ingredients with the mixer on low until there are no longer any clumps of flour. Add the coconut milk and mix until combined. Batter should be pourable, but not super thin. Stir in the lemon zest. Pour the batter among the 3 cake pans and bake 25-30 minutes, until the tops are just set and no longer wiggly in the center. Remove and let cool five minutes, then run a knife around the edges of the pan. Grab 3 large flat plates, line them with wax or parchment paper and invert the cakes onto the paper lined plates. Cover and let the cakes cool completely before assembling. In the bowl of a stand mixer (or use a hand held mixer) fitted with the whisk attachment, whip the cream cheese until light and fluffy. Add the ricotta and heavy cream, continue to whip until the the ricotta is smooth and the cream has fluffed, about 6-8 minutes. Add the honey + vanilla and whip until combined. Keep the cream covered in the fridge until ready to assemble. 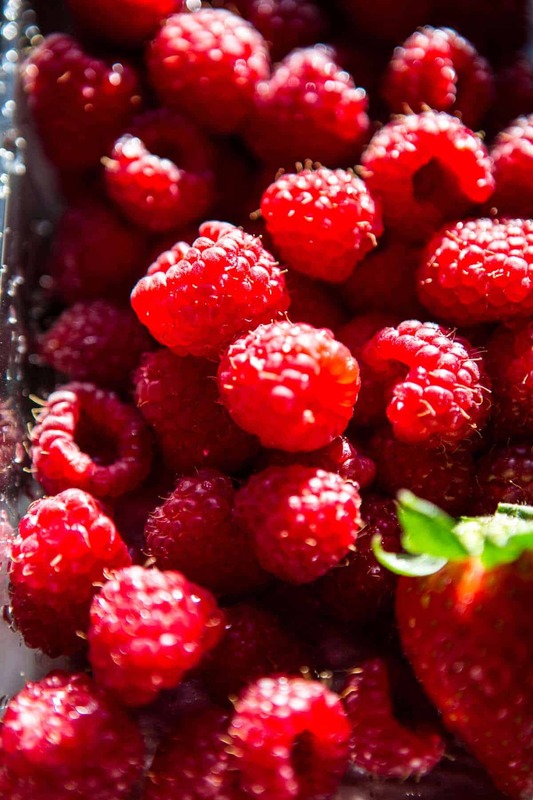 In a bowl, mash together 1/2 cup chopped strawberry and 1/2 cup raspberries until you have a loose sauce. 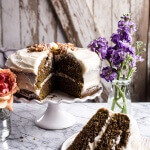 Place one cake layer on a serving plate or cake stand and drizzle lightly with honey. Spread 1/3 of the ricotta cream over the cake and then swirl 1/3 over the mashed berries into the cream. Crumble 2-3 meringues over top. Add a handful of fresh chopped strawberries, raspberries, orange slices and passion fruit. Repeat with the remaining 2 cake layers. Be careful not to over fill your layers with fruit or the cake will be hard to slice. 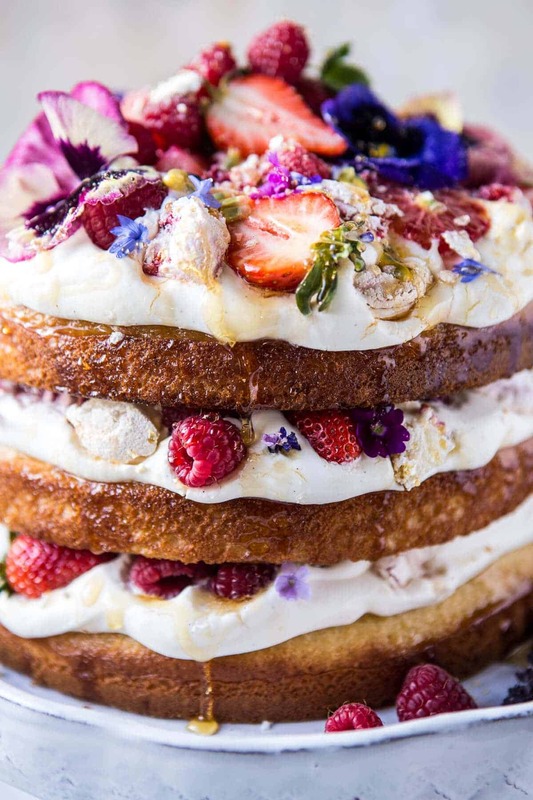 If desired, decorate the cake with edible flowers. *Coconut Cake adapted from [Martha Stewart | http://www.marthastewart.com/341935/coconut-layer-cake]. YUP. For sure, I mean, cake cures all!! ? Awee!! Thank you so much!! Means a lot! this looks amazing! 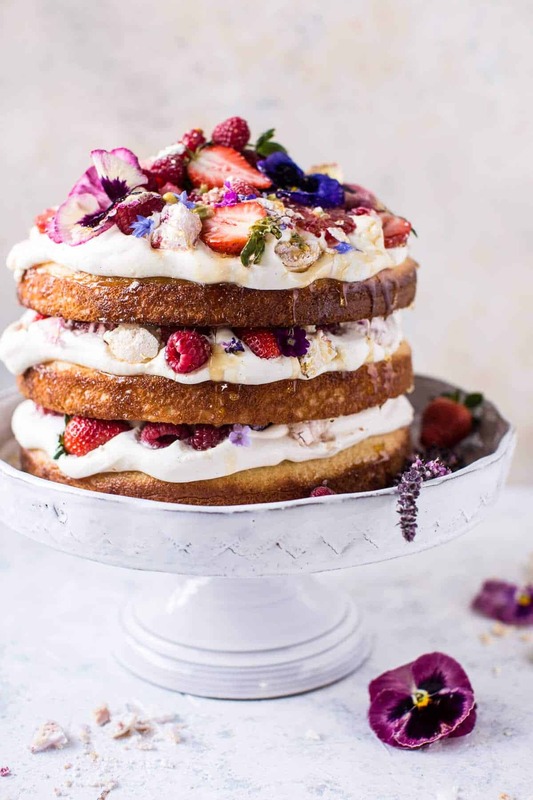 have you seen sweet style ca’s eton mess cake? 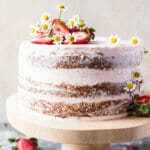 both of your cakes scream freshness and spring! Hmm, no I have never seen that cake?!? I’m not sure if I’ve ever seen such a beautiful cake! Love the flowers and fruits together. Also, whipped ricotta is such a good frosting – we made it for a carrot cake once! The wisdom tooth thing really depends! I was acared to death about pulling my own, because everyone and their dog told me it would be super painful, will definitely require stitches and take a million years to heal. I was out of the dentist’s room in 10 minutes, and 9.5 of those were waiting for the anesthetic to take hold. I had to chew on the other side for a while, but it healed nicely in no time, really. This cake, omg YES!!!! It’s like you wrapped Spring into an edible art piece!!! I hope your teeth pulling goes well so you don’t have to be on soft foods too long. It looks beyond gorgeous and delicious!!! This is so beautiful! I love all the recipes you put up this week and plan on making the green goddess pasta this weekend. I remember a great meal my dad made for me after I got my wisdom teeth pulled: His famous tomato soup, soft mashed potatoes, and a frozen fruit smoothie 🙂 really not bad at all. YUM!! That sounds amazing!! I am sure I will figure it out! Have a great weekend! 🙂 Thanks!! Love the edible flowers, such a nice touch! Omg wisdom teeth though…I think the biggest thing for me was that I got so tired of eating sweet things since most readily available soft foods are sweet…I was in so much distress that my mom made me puréed roasted cauliflower soup and we call it Wisdom Tooth Soup to this day! haha! Oh no!! Hoping it’s not as bad as I am thinking! Wow, what a perfect way to welcome spring Tieghan! 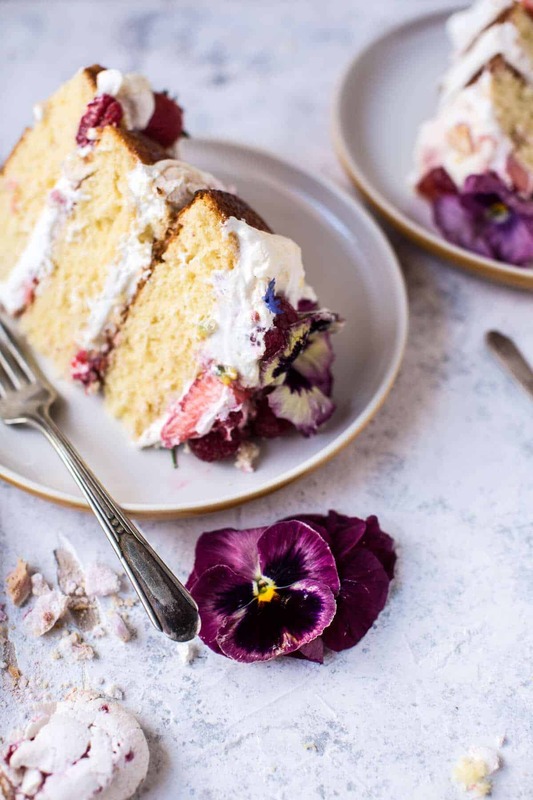 This cake is gorgeous and absolutely sounds delicious! Good luck with your wisdom teeth. I’d stick to ice cream and water ice the first day, but then I’d go all in for the cake! Have a great weekend and thanks for sharing this beauty! Gorgeous cake and perfect for spring!! The wisdom teeth pulling – over in a blink! Hope all goes well….you’ll be eating regular food in no time! This is lovely, just lovely! Eton mess is one of my all time favourite recipes, it’s light and super easy to make. The idea of making a cake from it is inspired! This cake-just gorgeous! Good luck with the wisdom teeth. Try to keep icing your jaws as much as possible the first 2 days. It really helps with the pain and swelling/bruising. You make great smoothies so they should be good to sip. They will probably tell you not to use a straw at first. With your fortitude you’ll get through this in no time! Wow this cake looks absolutely beautiful! Totally brighten up my morning seeing this! Stunning photography! oh what a beautiful mess! Thanks so much! Have a great weekend!! 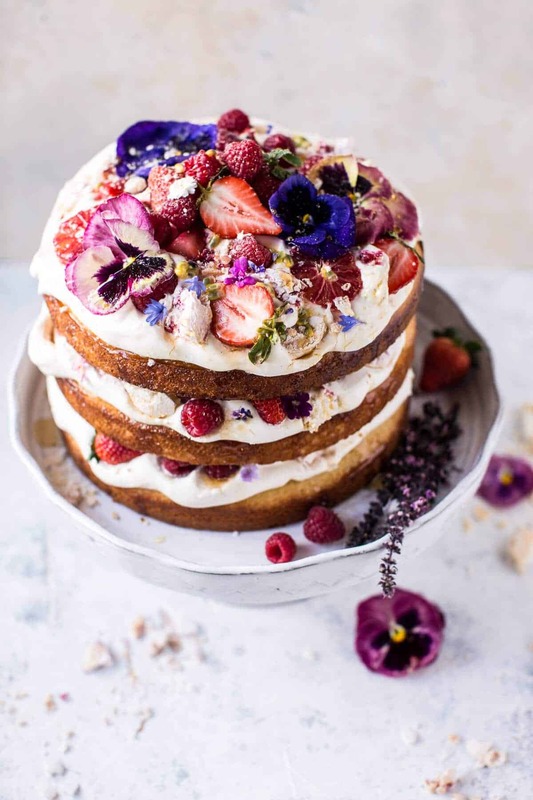 This cake is so stunning and just screams spring!! The photos are also so bright and spring-y and just gorgeous (as always)!! Srsly gurl. This cake is STUNNING. Good luck with the wisdom teeth… it’s never fun. Just say a prayer that you don’t get dry socket and you’ll be eating this cake in no time! Wow this cake looks perfect! You are amazing Tieghan! This cake is all kinds of beautiful! I am so with you…it’s pretty much Spring!! And I need something like this to add alllll the pep to my step! CAKE CAKE IT’S MY (UN)BIRTHDAY! LOL! This looks absolutely stupendous–I’d put it in a museum but eat it before anyone would get to take pictures! I’m so happy that spring is coming up soon–this means beautiful flowers, green grass, sunlight, more raw foods and spring cleaning! That being said, this is so beautiful. Lovely to see an Eton Mess without bananas. Tieghan, this cake is absolutely beautiful!!!! 🙂 Hope you have a great weekend! Absolutely gorgeous, Tieghan! I so want to dig into this beauty :). Hope the wisdom teeth procedure went well. Stick with ice cream, smoothies, yogurt… anything like that and you should be good to go! This cake is stunning Tieghan! Maybe it’s just me, but getting teeth pulled= so much crying. Not even from pain, though there’s pain, but just from all the emotions. I am always eating but after wisdom teeth, I could barely even drink, let alone eat. It all goes away quickly, but it’s pretty miserable. 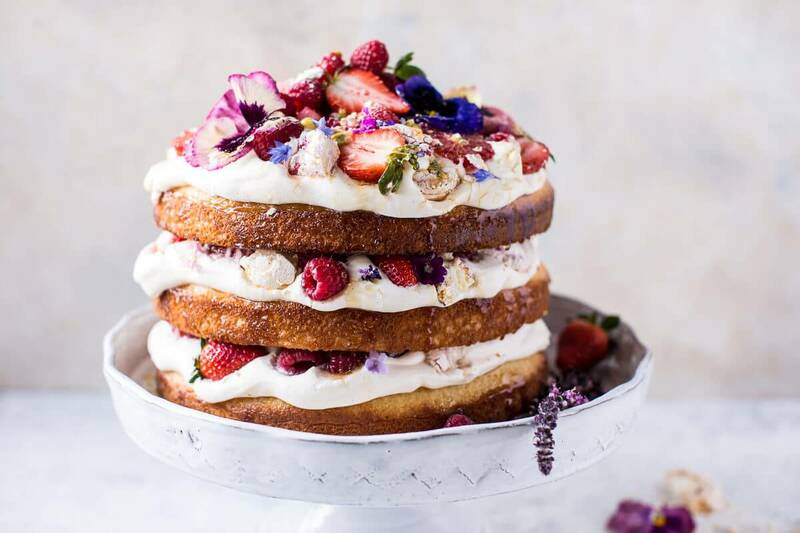 Beautiful cake and pictures–I have never eaten flowers and I know you can but I still feel it is a strange thing. Maybe because in the Cincinnati area I have never seen it. When I lived in Ohio, I would have never thought about edible flowers, but they are a great addition to so many dishes!! Plus, they are so fun! Thanks Nancy! Any thoughts on how to make this gluten free?? Cup4cup mix? It sounds delish and looks beautiful! Thank you? Hi Cristy! I personally have never tired it, but I would think your favorite gluten free blend would work great. I love Bob’s Red Mill Brand. Let me know if you have any other questions, thanks!! What an incredible cake! It’s so beautiful! This is a thing of beauty. 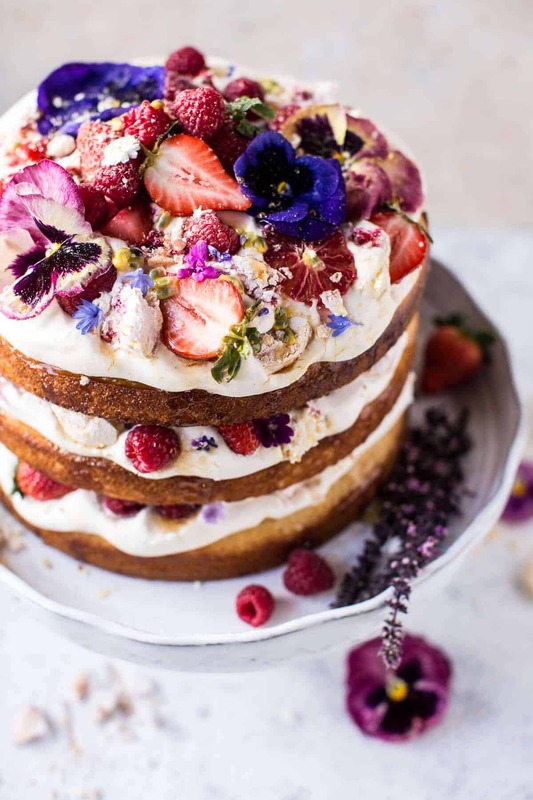 A cake perfect for the first day of spring! What a gorgeous cake! I can’t wait to make this… Can the cake layers be put in the freezer before to make ahead? I am looking to bake the cakes a week before heading to the cottage where I will put it together! Thank you so much! Hope you are having a great weekend!! HI! Honestly, I have not tried this in a 10 inch cake pan. Not sure if all the batter will fit, but if not just don’t use all the batter I would cook the cake maybe 5 minutes shorter than I have listed. When you say a fan oven do you mean convection oven? If so bake at 350 degree F. Please let me know if you have questions. Thanks! Ahh this is so beautiful!! I bet it tastes as good as it looks. I can’t wait for spring either. Just got back from a warm vacation and I am not ok with the cold again!! Thanks so much, Natasha! Hope you had a great weekend! This is almost too gorgeous to eat. ……almost! 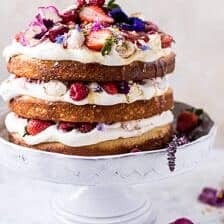 I adore this, we actually had an eton mess cake as one of the tiers of our wedding cakes, adding coconut into the mix sounds divine. This is such a beautiful cake!! When I got my wisdom teeth removed, it took me a week to spoon in a small strawberry milkshake! But, a friend of mine was eating doritos the next day so, wishing you the latter option!! Oh my goodness, what a very beautiful cake this is! Love the decoration and I’m sure it tastes as good as it looks. Oh. Em. Gee, Tieghan!!! Cake AND Meringues together at last! My two favorite food groups! This will be made ASAP!! And what a beauty it is! Hope your surgery went without a hitch and you have already consumed those last two pieces by now! P.S. Got my eyes peeled for some chamomile flowers so I can make those ridiculously yummy looking palomas! Seriously, Cake goals! I hope your mouth is on it’s way to healing / already healed. Getting your wisdom teeth pulled is no fun. And make sure to clean it out properly. I have a friend who didn’t and her mouth got infected which made the whole transition back into proper food all that much harder. Oh and I have been cleaning it..but maybe not enough. Going above and beyond ofter reading about your friend! Hi Tieghan, I love your blog, you do such fun stuff! Small world moment, a couple of months ago I sat next to a guy on a flight from Denver to Cleveland who is a friend of your father’s and he gave rave reviews about all of your cooking and what a great girl you are! Anyway, I wanted to comment above on Cristy’s question about gf but I couldn’t get that to happen….I don’t know if you can send this info to her or not, but… I did this cake gf and it came out great! I used Pamela’s Artisan Blend, I added 1 tsp of xantham gum and reduced the sugar by 1/4 cup (cause I think gf flours tend to be sweeter). It is wonderful. Thanks for the great recipe. So happy the gf version was a success! What a small world!! Glad to hear I got good reviews! Hope you loved it!! i have previously made the martha stewart coconut cake & it is delectably moist!!! cant wait to make this version!!! what type of edible flowers did you use besides pansies? Hi!! Thank you so much! I used micro orchids and herb blossom flowers. Let me know if you have any other questions! Thanks again!! Hi Jennifer! Thank you so much! You can assemble this either the night before or the morning of. Either will be great, but make sure to keep it in the fridge until about 30 minutes before serving. I would probably assemble this in the morning just to make sure none of the fruit bleeds into the cream, but taste wise assembling the night before should work great too! Let me know if you have questions. Hope the cake is a hit! ? Of course!! Happy your making it!! I made this cake last weekend! It was amazing, with a caveat that I hope will help those wondering about making ahead. We baked the cakes a day before and kept them covered at room temperature. The cream was made the morning of and kept in the fridge, and the cake assembled about 4 hours prior and put in the fridge. I didn’t have meringues or edible flowers on hand so I used a mix of whole and chopped berries with a bit of lemon zest. It might have been because some of those berries were smashed, but by the time we took it out of the fridge they had bled -and the inner layers of cake, cream and berries had somewhat mushed together, making a slightly soggy cake. That said, no one cared one bit and everyone proceeded to gobble it like cake monsters. The batter is to die-for. Coconut milk? Who knew?? The cream is only faintly sweet, which I thought worked beautifully with the pound cake and the interlaced honey. I am not an experienced baker, so next time I will probably make the cakes and serve the cream and mashed berries on the side. 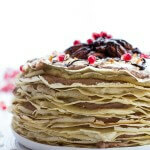 Not the visual feast that is a triple layer cake, but more practical to make and eat. All in all, a huge success even if it didn’t look as pretty as the original. Thank you for an amazing recipe. A keeper. Hi Anabel!! So happy the cake was such a hit, that is awesome! Sorry it bleed on you though. That happens because of the mashed berries. The cake, presentation wise is best assembled just before serving. Thank again and I hope you are having a great week! Love Eton Mess! Great idea to do it in cake form! So pretty! The whipped ricotta cream was a total fail. The ricotta failed to blend into the cream smoothly, and the more I beat it, the more liquid it became. Am making this for a friend’s birthday and could cry at this point. I am really sorry you are having so much trouble. Are you using whole milk ricotta? I make this whipped ricotta all the time with no problems so I am not sure what the issue could be. Did you do anything differently? Again, SO sorry. Let me know what I can do to help. If all else fails, you can just make regular whipped cream. Sorry! Hi Danielle! Really any other milk will work great. Whole milk, goat milk, almond, whatever you love to drink. let me know if you have questions. Hope you love the cake! This cake is gorgeous! I’m going to make it for Easter brunch 🙂 Question: i’m not a big fan of ricotta. Can i substitute is with more whipping cream and cream cheese? So many great comments, but I may have missed my question. The meringues? Is this with a vanilla cookie bottom? I’m not real familiar with it. Made this cake this week and was totally impressed!! Totally stunning and delicious too! So happy you like it Natalie! Thank you! have you any ideas on how to preserve edible flowers so they don’t wilt too quick? I have a few left which I wont use for a few days but don’t want them to spoil..
I’m really glad you enjoyed it! Thanks Zara! Any suggestions on making the cake ahead? Just the cake. I’ll make the rest day of. Making this for my sons first birthday and trying to cut out as much day of as possible. Hi Tieghan! Just wondering if you have a meringue cookie recipe? I found a random one online, but yours look so good with the berries or jam mixed into them? I already made my meringues, but curious for next time! This is the tastiest, the most beautiful cake I have ever made! Your recipes are the BEST! Thank you! I live up high in Colorado (like you!) and was wondering if you need to adjust the baking of the cake in order to make it work up high or if you can just follow the recipe as is. Hi Ashley! This recipe should work great as is! I hope you love this! I made this cake for my Sons first Birthday and it was delicious. Loved loved loved the batter and the flavour of the cake itself. With the ricotta cheese icing. I ended up adding a bit more sugar and lemon. Assembled it and forgot the meringues lol. It was still delicious and had the wow factor for the whole family. Big hit! Thank you. I am so glad you liked this Ayesha! Happy Birthday to your son! Thank you!